On Nov. 2nd the Hythe Community Centre showed signs of Christmas. The annual Christmas Craft and Small Business Show had over 45 vendors displaying their crafts and wares. 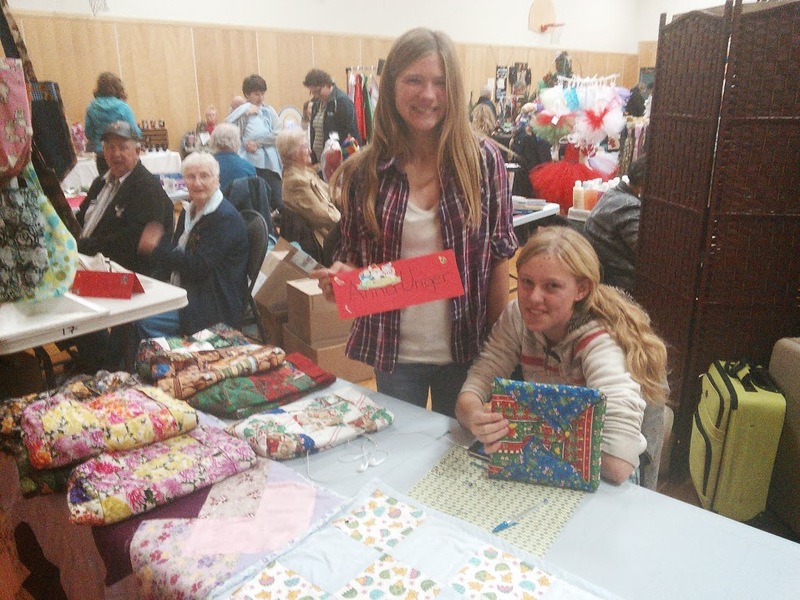 Local residents had many opportunities to begin their Christmas shopping and vendors were busy selling and packaging items sold. At noon the Hythe Playschool moms and the Centre staff sold lunch to the shoppers and vendors. Working together as a community helps both the Playschool and the Centre. We appreciate the willingness of Playschool to partner with us in the venue and look forward to further fund-raising ventures together. At 1:00 pm Santa arrived and visited with the young and the old alike. Both age groups enjoyed sitting on Santa's knee, receiving their candy cane and the visit. Many of the youngsters were concerned about the whereabouts of Santa's reindeer but were soon convinced they were well and ready for the trip on Christmas Eve. We would like to thank all the vendors who took part in the event and to all who gave us feedback on how to improve the sale for another year. This type of input is very valuable. Events like this are made possible only through the hard work of many volunteers and we appreciate the efforts of each individual. Thanks goes out the Ashley Ireland for her work getting our vendors, to Shirley Fisher for her decorating, advertizing and help while we set up the event and then took it down, to Terri Robertson for doing the face painting with the children, to Ada Dahl for her help serving lunch, to the Playschool moms for the pies and working the lunch, June Jenner for spending her day selling our raffle tickets and to Ron Baker for all his help setting up the venue and help taking it down. We consider ourselves fortunate to have had two Village Counsel individuals get involved with our venue. Thanks goes out to Counsel-woman Carol Descoteau and Counsel-man Gordon Nickelson and his wife Caroline for their involvement taking the venue down and with clean-up. And of course without our community the event would not have been a success. We thank each of you who came. Your attendance not only helped make the event a success but it gives our Board the encouragement to plan for another year. Although it is early, on behalf of the Hythe and District Recreation Society, we thank-you and wish you all a Merry Christmas. Nomination Day at the Village of Hythe was fairly quiet, reports Hythe CAO Greg Gayton. Five positions on Village Council have been filled by acclamation, with incumbents Gary Burgess, Carol Descoteau, Cheryl Phillips and Lyle Sipe joined by new member Gordon Nicholson who replac es retiring Brian Peterson. Nicholson and wife Caroline are relative newcomers, having been Hythe residents for just over three years. Having worked in highway maintenance in B. C., Nicholson is now retired. "Hythe has been good to me and now I want to see what I can do to help, " said Nicholson. When approached by friends to put his name forward, Nicholson thought, "I'll give it a try." Under the Municipal Government Act, the Village Council appoints one of the councillors to the position of mayor. Producers have been enjoying terrific weather for harvest for the most part across West County. Here, Ron Jones swaths canola near Rio Grande earlier this month. The 38th Annual Hythe & District Ag Fair was a huge success. A little bit of rain did not hamper this year’s fair. Kudos to all the wonderful volunteers who helped make this event such a huge success. Thank you to everyone who had a part in the fair big or small. Matthew, Travis and the crew from the Village for mowing grass, setting up and taking down the tables in the Curling Rick and Arena, and for last-minute grading. The Curling Rink and Arena for the use of their facilities. The Enerplus Energy and Hythe Elks for the wonderful pancake breakfast. We heard they served double what they did last year! Max MacAulay for the use of his Esso tent. Judy Amendt, Christine Livingstone, and Frank Webb for judging the parade and ensuring it moved out smoothly. Renay Morgan for organizing the Trade Show. The Hythe Community Centre for running the Arena concession. Terry Hatfield for another wonderful Church Service. The Grande Prairie Marching Band for coming out again this year and for performing at the Hythe Pioneer Home for the residents. I received alot of comments on how wonderful they sounded and how happy people were to see a marching band back in Hythe. Randy and Patti Nichol for organizing another successful Heavy Draft Horse show. Kim Moodie for organizing the Light Horse Show. All the people who set up the schoolwork, the conveners and judges for the Exhibit Show. An extra special big thank you to Sara Rawlyk for taking on the Exhibit Venue. The Hythe Ag Society for the fabulous homemade pies in the Curling Rink; special thanks to Michelle Huey and Melodie Reed for organizing and selling the pies. The Hythe Swimming Pool for the refreshing afternoon free swim. Debbie Kelly for providing Cotton Candy and Snow Cones -- it’s not a fair without sugared -up kids! The Goodfare Hall Ladies for the wonderful supper of beef on a “homemade” bun, ands those yummy homemade desserts, a special thanks to Linda Waddy, Sharon Albright, Elma Mackie, and Joan Kyle and their spouses for all their hard work. To all those who entered floats, exhibits, had tradeshow tables, and entered horses in the Horse shows. Without your participation these events would not take place. Colton & Ryan Hewitt and Nadia Rawlyk for cleaning the Arena and Curling Rink after the event. Bill Guise for cleaning up and cutting the grass in lot across from the Curling Rink where the Esso tent was set up. It is with your support that we were able to host such a wonderful fair and were able to make all the kids venues and activities (Lazer Tag, Obstacle Courses, The Bouncy Castles, Tattoos, Face Painting, etc..) FREE ! If anyone has any suggestions they would like to see next year please contact Lori Hewitt. Once again thank you to everyone who had any part in making the 38th Annual Hythe & District Agricultural Fair a success. If I missed your name it was not that your participation went unnoticed. My final thank you is to you, the Community, for coming out and supporting the events and showing your community spirit. The Light Horse Show went on to be a success, despite a few rain showers, and provided good entertainment for spectators. Each year our little show provides opportunity for all riders including; those without a lot of show experience, or riders with young horses, to try something new and have some fun. We look forward to having even more contestants next year! We would like to thank Lindsay Buekert for doing a super job as judge this year and Robin Hill for supplying all of the obstacles for the trail class. Hythe and Beaverlodge communities are both hosting the much-anticipated agricultural fairs this weekend. West County residents will be spoiled for choice of activities. People have been readying exhibits, prepping floats, dusting off their boots and stoking their appetites for the 38th Annual Hythe & District Agricultural Fair this weekend. This year there will be an arena filled with new and exciting bouncy toys and obstacle courses, lazer tag, face painting, and tattoos. The Hythe Elks are teaming up with Enerplus Energy to serve up pancakes, eggs, & sausage at the kick-off breakfast from the arena from8 to 10 a.m. will fortify patrons for the day ahead. Don't forget to enter your float in the parade, there is no entry fee but a lot of fun to be had. The parade moves out at about 10:30, followed by an Interdenominational Church service will be held across from the arena in the Esso tent provided by Terry Hatfield. It’s open to one and all. Visit the exhibits and trade show all day long until 4 p.m. at the curling rink. Get your entries in the exhibit show and win cash; for more information contact Michelle Huey at 780-356-3424. The trade show is always popular for buyers and vendors alike. To book a table contact Renay Morgan at 780-356-3616. The kids will want to pop by the arena for all manner of activities such as lazer tag, face painting and tattoos, served up from 11 a.m. to 4 p.m. The GP Marching Band performs at the Pioneer Home at 1:30. There’s free swimming all afternoon at the pool, and a Community Supper from 5:30 – 7 p.m. at the Community Centre winds up the day. You might think holding the prestigious status of Hythe’s longest practicing doctor would come hand in hand with an ego, or at least personal recognition of your status. But that’s not the case with Dr. Robert Crowe of Hythe Medical Centre and the Beaverlodge Hospital. Speaking with Dr. Crowe the only visible emotions are ones of mild bemusement at the attention and thankfulness to the Hythe community and medical team. Dr. Crowe moved here in 1988 from Limerick, Ireland with his wife Margaret, a nurse at Beaverlodge Hospital. Today Limerick boasts a population of about 91,000, quite a bit larger than Hythe’s 820 and Beaverlodge’s 2,300. But the numbers, undoubtedly smaller in the 1980s, did not deter the Crowes. Unlike a lot of immigrants the Crowes didn’t spend time in a larger city. They came straight to Hythe and have been here ever since, excusing the odd visit back to Ireland, of course. According to Dr. Crowe, the couple returned to Ireland often in the beginning, visiting parents and friends, but as the years passed Hythe became more and more their home. Dr. Crowe took over the practice from a departing physician in the original medical building, slipping right into the routine of the place. Reminiscing about his move he recalls the hardest adjustment was the culture shock. Not only did the Crowes leave the city for the country, they left one country for another. That closeness that crosses the borders of private and professional life is clearly one of the highlights of Dr. Crowe’s practice. Knowing the ins and outs of Hythe’s tight-knit community he refused to share any outrageous or amazing stories, knowing that the chance of the story being recognized was high. Instead, he brought up the privilege of treating generations of families. In 25 years of practicing Dr. Crowe now treats the children of the children of his first patients. From the actual births, to weigh-ins, to bumps and bruises Dr. Crowe has seen it all, and of everything that being a part of Hythe’s medical team has brought him, that is one of his favourite parts. The other focus of Dr. Crowe’s practice and another of his passions is training doctors that come to Hythe and Beaverlodge to complete their schooling. Part of medical school involves hands-on practice, driving many students north in search of work and better opportunities benefiting northern communities that lack medical support. The training doctors working with Dr. Crowe sign on from two to five months, with many opting to stay in Northern Canada. Something Dr. Crowe finds completely natural, rising out of his total commitment to his home, community, and the medical team he works with in Hythe and Beaverlodge. When asked whether he feels like a central part of the medical team here Dr. Crowe only had words for the commitment and hard work of the medical team that rotates through Hythe and Beaverlodge. Because of the support from the community, patients, and nurses the neighbouring towns enjoy a stable medical community. Dr. Crowe’s final words on the question of his influence in the community are for the people, for their patience as he helps train the next generation of doctors, for their support and foresight that enabled the expansion of Hythe Medical Centre, the creation of the primary care network, and the opportunity to be a part of the generations of Hythe in his 25 years as doctor here. Now that Beaverlodge is one of 24 communities targetted for Family Care Clinics by Alberta Health Services, a working committee that will play an integral role in developing a plan for the facility will be struck. FCCs provide team-based non-emergency primary health care services such as diagnosis and treatment of illness, screening, immunization, health promotion, chronic disease prevention and management. Each is expected to provide extended hours of service, same-day appointments and access to the most appropriate member of the care team. The province has already opened pilot FCCs in Calgary, Edmonton and Slave Lake. The province has said FCCs are meant to complement the services provided by 40 Primary Care Networks (PCN). Beaverlodge and Hythe medical clinics are PCNs, meaning they are privately owned physician offices that receive supplementary funding from the province to hire other health professionals to help deliver enhanced services to their patients. “Our hospital is threatened – not necessarily that the province is going to close it but that it’s falling apart,” said Miller. These are early days and there are many questions about the model, one of them being whether the FCC is duplication of a PCN, said Miller. “Throughout the province no one seems to have any idea and even our own Alberta Medical Association (AMA) questions this,” he said. AMA President Linda Slocombe has said, “It’s just still unclear exactly what these FCCs will look like, how they will integrate with the primary care that is already being delivered through family physicians and existing PCN. “There’s still a lot of unknowns and questions in my mind, as to what the role of these FCCs actually is.” Health Minister Fred Horne said the FCCs will be community-led and the province will work with each community in the coming months to develop plans for each. Anesthesiologist Dr. Mark Ewanchuk told The Edmonton Journal last week the province will need 600 advanced nurse practitioners to staff the new family care clinics; professionals who need as much training and are as scarce as family doctors. Still, Mayor Hanson said it’s time to build on the announcement to meet immediate and future needs to develop a ‘real’ go-forward plan that starts now. “Everyone is very aware of the conditions of our existing health facilities and receiving a level of commitment from the government to start working with our community to address our needs is welcome news,” she said. “Through the generous donation of land by local resident, Doris McFarlane and servicing completed by the Town of Beaverlodge, we have a significant head start on readying a site for development consideration,” added Hanson. “I feel this positions our community to develop a unique rural health facility that can address the needs we have in our area.” “Long-term needs and services will be included as we work through the process to ensure our community needs are addressed,” she said, adding it will be important “a good cross-section of community members” be retained for the working committee including doctors, health care practitioners and members at large. “This has to be a ‘roll up our sleeves and get it done’ committee so a time commitment to help make things happen will be essential for those involved,” said Hanson. Nevertheless, local doctors have serious concerns that they are hoping will be addressed. “We’re not sure this is in the best interests of West County residents,” said Miller. Primary health care addresses Albertans’ day-to-day health care concerns with a wide range of coordinated services. This may mean an annual check-up with a family physician, consultation with a pharmacist, or support in accessing mental health services or managing a chronic condition like diabetes. Primary health care combines the expertise of many different providers to support people and their families. What is the difference between Primary Care Networks (PCNs) and Family Care Clinics (FCCs)? PCNs are groups of family doctors that work with Alberta Health Services and other health professionals to coordinate the delivery of primary care services for their patients. A PCN is a network of doctors and other health providers such as nurses, dietitians and pharmacists working together to provide primary health care to patients. A PCN can be comprised of one clinic with many physicians and support staff, or several doctors in several clinics in a geographic area. The Alberta government provides supplementary funding to hire other health professionals to help deliver enhanced services to their patients. Each network has the flexibility to develop programs and to provide services in a way that works locally to meet the specific needs of patients. FCCs are local, team-based primary health care delivery organizations that provide individual and family-focused primary health care services that are tailored to meet the health needs of a community. Clinic staff co-ordinate a comprehensive range of primary health care services that cover an individual’s entire lifespan. FCCs provide patients access to the most appropriate member of a health care team who can address their health and social needs. The clinics are expected to have extended hours of service and provide same-day access. Team members may include family physicians, nurse practitioners, registered nurses, dietitians, pharmacists, mental health professionals and others. How many PCNs are there and how many health professionals are involved? There are currently 40 PCNs operating in the province, involving over 2,900 family physicians and more than 700 other health care providers. They deliver primary health care services to more than 2.9 million Albertans. How many FCCs are there? Three pilot FCCs, the first wave, began operations in Edmonton, Calgary and Slave Lake in April 2012. There are 24 communities across the province that are identified for the second wave of FCCs. Seeding operations in West County are nearly complete. If the rain holds, crops will all be in the ground by the weekend, reports Alberta Agriculture Market Specialist Dave Wong. Canola is seeded shallow and some crops may have seen severe wind erosion. The Central Peace isn’t far behind West County. “They’re between 70-90 per cent done, and Falher is sitting around 70 per cent,” he said. Producers in Fort Vermilion and La Crete are way behind, at most about a third completed. That area as well as Falher and Manning took some rain this week, so they’ll have to sit tight a few more days, said Wong. Seeding operations in Manning are about half done. Wheat and peas go in the ground first because they can handle colder soils --though that isn’t a factor anymore -- followed by canola. ers can seed up to 300 acres a day so many growers can complete seeding in 10 days,” says Wong. As well, he adds, longer days mean producers can seed later. Soil moisture conditions across the Peace are good, with some producers still navigating around low spots. Still, the Peace region is huge and Wong said producers in some areas are going full bore while their neighbours are still waiting for better conditions. Producers in the Peace are actually right on schedule for the most part, he said. Historically, said Wong, May 7 was the best before date in the days of harrow and cultivator. “Now, with direct seeding and the right conditions, progress is much faster.” Producers in West County should be generally happy, he said. “Things are looking good.We have really good moisture conditions with the wind everything’s dried up nicely and we were able to get going earlier than expected,” said Wong. “Once we get a bit more moisture we should get a really good start. “The poplars have leafed out and with the wind and heat everything is starting to come like crazy. said Tofteland. He had worried about some taller ones, and had those tethered with chains. They weren’t even budged. Tofteland said he’s hoping to recover some of the damages from insurance and estimates replacement cost to be about $10,000. “It must have been almost like a mini-tornado,” said Tofteland. A Beaverlodge woman was at the centre of a regional law enforcement manhunt that began Monday and ended peacefully in the early morning hoursWednesday. Donell Adair was robbed of her pickup truck at gunpoint at about 7 p.m. Monday night in her own driveway just behind the Beaverlodge Motor Inn. Adair had just exited her vehicle to see a smaller blue car pull in behind her. A white male got out with a shotgun and demanded the keys to her 1999 grey GMC truck. He responded by firing the shotgun into the ground about three feet from where Adair was standing. He then trained the gun on her, demanding again for her keys. She gave them to him and, after transferring some items from the car into the back of the pickup box, the man took off. Shaken, Adair ran inside the house to tell her partner. He took off in pursuit but the truck -- and the man -- were long gone. It all happened in about five minutes, said Adair. The affects are lingering, she said. “I was terrified, to have that happen right in front of my own house. “I hardly slept that night,” she said. “Stepping out of the house the next morning I was scared. Adair is breathing easier now that regional police announced Wednesday they have a suspect in custody. At approximately 2 a.m. Wednesday members of the RCMP's Emergency Response Team entered a home on a rural property that had been surrounded since Tuesday afternoon. Once inside the home they located the suspect in the attic. The suspect surrendered to police and was taken into custody without further incident. The suspect, considered armed and dangerous,had been involved in a number of armed robberies including a car chase that RCMP called off due to safety concerns. Police continue to investigate incidents that occurred Monday and Tuesday to determine if they are related and connected to this suspect. The suspect, a 24-year-old male with no fixed address, remains in custody. The suspect is facing charges related to robbery, firearm offences and flight from police. The RCMP would also like to thank STARS for their assistance in helping to search for the suspect and the stolen vehicles, along with Vieworx Geophoto Inc. who offered the use of their helicopter to assist in aerial reconnaissance until an RCMP helicopter could arrive on scene. A black Honda Civic that was stolen at gunpoint along with two pick-up trucks that are believed to be associated with this investigation. Adair said friends had told her of another woman in Beaverlodge that had been approached earlier before she was accosted. Beaverlodge elementary schools did not receive official notification regarding keeping students indoors during the height of the manhunt. Grande Prairie schools were asked to keep students inside the school merely as a precaution. You could be forgiven for thinking you’ve walked onto the set of a CSI episode. There’s a DNA separator here and a spectrograph over there. I might have the terminology wrong, but there’s no doubt this is a top-drawer facility. The specimens here aren’t people, though. They’re bees. Honeybees. As of this week, the $2 million+ facility is now open for business in Beaverlodge. Funded in part by Western Economic Diversification, Grande Prairie Regional College’s National Bee Diagnostic Centre (NBDC) Laboratory is now accepting samples for diagnosis. The laboratory, home to the only federal bee research program in Canada, will address the current crisis in bee health through comprehensive diagnostics and surveillance data for industry and government/regulatory bodies. Services will include research on honeybee pests, pathogens and parasites using advanced scientific techniques. Stakeholders say the facility will be a boon to the Canadian honeybee industry. I had the good fortune to be the first to tour the new lab with the full lineup of state-of-the-art equipment now in place and ready to go after being tested through the winter. Now that diagnostic work has commenced (April 1), most of the lab is off-limits to the general public. The building has plenty of curb appeal, echoing GPRC’s Grande Prairie campus, situated on the Beaverlodge Research Farm in partnership with Agriculture and Agri-Food Canada and the beekeeping industry. The operatingbudget is about $300,000 annually. “This is such an exciting project to be a part of,” said Dr. Carlos Castillo, NBDC applied scientist manager. Castillo, originally from Peru, came to Beaverlodge for the position about a year ago. Previously, he conducted horticultural research in his home country and Japan, where he secured his Masters and PhD before coming to Canada in 2006. Most recently, Dr. Castillo completed a four-year international honeybee research project at Simon Fraser University. He accepted the position heading up the Beaverlodge lab about a year ago. He’s been at work ever since selecting equipment, fine-tuning lab design, and commissioning diagnostic equipment in the run-up to the April 1 start date. He is assisted by diagnostic technician Patricia Wolf Veiga who has extensive research experience in soil and microbiology, molecular biology, and has worked with Africanized honey known colloquially as “killer bees” in her native Brazil. Rounding out the staff at the Beaverlodge facility is administrative assistant Lee-Anne Alde. The 2,000 sq. ft facility is very unique in Canada. “This is the first of its kind designed and outfitted exclusively for honeybee research,” explained Dr. Castillo. For now, honeybees are the focus of the diagnostics, but Castillo said the scope will be broadened as the laboratory evolves. The NBDC will contribute toward a healthy, sustainable and profitable apiculture industry across the country, says Dr. Castillo. Microbiology, microscopy, and molecular techniques will be employed to identify bacteria, fungi, mites, and viruses that affect honeybees. These pathogens reduce honey production, weaken hive strength and sometimes lead to colony collapse. Samples of brood, adult bees,frames and honey are now being accepted from registered Canadian bee producers on a fee-for-service basis. They will be entered into a database, labeled and stored. Since 2006, honeybee mortality has been increasing worldwide. Canadian beekeepers have been reporting over-wintering losses averaging approximately 30 per cent for the last five years. That figure is double previous levels. South of the border, the industry has faced high losses of seemingly healthy bees due to Colony Collapse Disorder. This has triggered a worldwide search for causes, explains Dr. Castillo, who said diagnostics here in Beaverlodge may eventually shed light on whether the losses are due to a surge of pathogens or perhaps environmental factors such as weather change, pollution or pesticides. Of course, Beaverlodge and the venerable Research Farm has deep ties to the honey bee. This area is home to the greatest density of honeybee colonies in the province, and bee research has been ongoing up on the hill since 1992. Dr. Stephen Pernal has been in charge of the bee program at the research farm since 2003. Now that GPRC has reintroduced its Commercial Beekeeping Certificate program at its Fairvew campus, it’s all very sweet news for Peace apiculturists. Dr. Castillo says the NBDC has begun to build a database including geographic parameters so “hot spots” for certain issues might be flagged. Nosema spore and varroa mite counts, deformed wing virus, tracheal mite detection, EFB and AFB detection, antibiotic resistance determination and virus detection are services provided at the new NBDC. Determining hive infestation or susceptibility as far in advance as possible and prescribing treatment will go a long way to improving sustainability, said Dr. Castillo. GPRC says the NBDC is expected to perform approximately 1,500 diagnostic services each year for businesses and other clients. The LaGlace Agricultural Society is hoping to garner financial support for an $8 million multiplex in their community. Spokesperson Monique Thickett says the current arena needs replacement. The group took their case to County of Grande Prairie council earlier this week. They got what they wanted, for now. Council will write a letter of support the Agricultural Society can use when it pursues potential funding supporters. The County contracted an assessment of the aging building following a feasibility study that was completed last fall, explained Megan Schur, County parks and recreation manager. The assessment, conducted by Field, Field & Field Architectural-Engineering Ltd. , estimates the cost of repairs to the arena to be approximately $1.7 million. Most of it is for upgrades to electrical and plumbing systems to bring them up to code, as well as insulation and groundwater issues, said Thickett. Thickett added there are “phenomenal amounts” of maintenance required, including condensation issues on the ice surface. Currently, four hockey teams play out of the LaGlace Arena: Junior and Senior novice, Peewee and Atoms as well as two men’s and one women’s team. “The $1.7 million required to fix the building is just for now,” said Thickett. “In a few years there will be other things to fix that currently are just passing code. The $8 proposed project would include a regulation ice surface, room for 350 spectators and would incorporate the curling rink which would be serviced by one ice plant for both ice surfaces and an updated kitchen and expanded eating area. Thicket said Phase Two of the project could include a walking track and fitness platform. County Council requested the Agriculture Society present its business plan prior to County’s fall budget deliberations. “One of the pillars of the County of Grande Prairie’s strategic plan is to encourage and promote recreation and related services as well as support our communities,” said Schur. She said less than 10 per cent of the 57 assessed components of the current arena rated as acceptable or better. Thickett said her group is about to roll out packages to corporate sponsors now that it has its letter of support from the County. Conceptual drawings for the new multiplex are done, and cost estimates will be secured soon, she said. “We’re going out to give everyone a look and what we’re doing here and hopefully get some dollars,” said Thickett. She said the group hopes to have a definitive go-ahead by this summer. Aside from corporate sponsors, federal and provincial dollars will be sought, and a number of fundraising events will be rolled out. “This is the first time for all us with something like this,” she said. “We’re hoping for the best and putting our best effort forward. “The LaGlace Ag Society is a really active , excellent group,” said Schur. She said Council will review both studies and the Society’s business plan before it determines if it wants to be a financial partner.